Netherlandish painter from Brabant, who succeeded Malouel as court painter to the Duke of Burgundy in 1415. 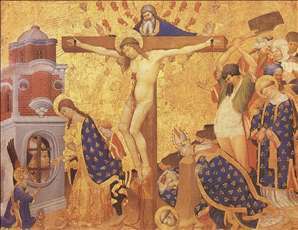 He is documented in 1416 as completing an altarpiece left unfinished by Malouel, which can be identified as The Martyrdom of St Denis in the Louvre. The painting appears to be the work of two hands, and the more naturalistic, less elegant parts are given to Bellechose. See more details about "Martyrdom of St Denis"